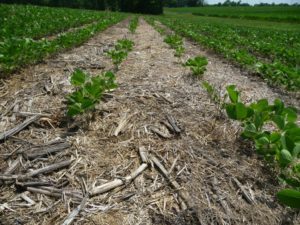 Why is Managing Residue Important? Why should farmers be concerned with residue management? Over the last several decades, corn, soy beans and wheat genetics have been tremendously improved. With these improvements, farmers have experienced higher yields, but have also experienced a residual effect – a greater delay in the decomposition process. So, why do farmers need crop residue to decompose rapidly? The consensus among farmers over the last several decades is that residue is breaking down more and more slowly which is causing them even more problems. These problems include: poor seed placement and residue becoming entangled in tillage and planting equipment. The problems farmers are experiencing can be attributed to the high levels of lignin (cellulose) found in the new varieties of corn, soy beans and wheat which have become highly resistant to weathering decomposition. Because of these problems, farmers are seeking ways to accelerate the decomposition process. How are Monty’s Plant Food products making a difference in sustainable agriculture? Since 1997, Monty’s Plant Food Company has been at the forefront of working with farmers to provide solutions that not only address residue management, but also contribute to the overall health of the soil. Monty’s products are specifically designed to enhance soil biology and promote the health of the plant through its root system. In the fall, Monty’s Plant Food Company promotes a residue management program for pastures and hay fields as well as post-harvest behind crops. The program consists of Monty’s Liquid Carbon and Monty’s Agri-Sweet. These products are a food source that stimulates the soil biology to feed on the existing residue. Some farmers add 3-5 gallons of liquid nitrogen per acre, especially where the residue is extremely heavy, to aid in the break-down of the residue. Spraying all of your residue does not result in an immediate disappearance of the residue. However, it does result in increased soil activity that causes the residue to shatter into pieces when any tillage and/or planting equipment runs through it. This has the added benefit of releasing many nutrients that will feed next season’s crop. > Click here to learn more about Monty’s residue management program.